What will her future hold? The future’s so hard to see! When it comes to parenting teens, you might find that everything’s connected. I’ve been noticing lately that everything’s connected in my life. When I take the time to look, events that might at first glance seem to have happened randomly, upon closer inspection, have common threads running through them. When I reflect further, I often find areas where God might be speaking to me – there – in the midst of the mundane. I wonder if you’ve ever noticed the same type of thing in your life? One of the things I’ve been puzzling over lately is how to successfully navigate being the mother of a 16 year old daughter. She is not the same little precious infant who came out of my womb. All of her life has been spent changing and evolving, moving toward becoming an independent, fully functioning adult. That is, after all, her job. It is, in fact, the job of each one of us. And while I serve in the role of “the mother”, that particular job description is in constant flux. The way you parent when your child is a toddler is completely different from how you parent when your child is a teenager. And if I do my job right at this stage, I will have, in short order, worked myself out of quite a few of the responsibilities I presently fulfill. It’s common knowledge that adolescence is a difficult stage in the life a human being, but learning how to evolve my parenting style as my kids have reached it has been one of the hardest things I’ve ever done. I think there’s a mourning that parents of teens go through that isn’t talked about much. We long for the days when the challenges parenting presented were a lot easier to control. 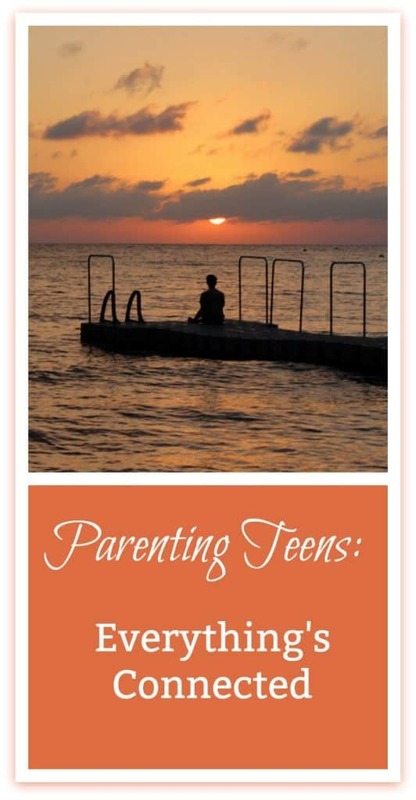 Parents of teens have to learn to let go of the older, more familiar ways of parenting. In the child’s earlier years, we felt, perhaps, more in control of certain variables and able to set clearer boundaries. As our kids mature, we have to learn to parent with a lot more uncertainty, a lot more prayer, and a lot more hoping for the best. I’ve thought of a couple of things that have happened lately that might illustrate what I’m trying to say about everything being connected. The other day, my daughter had gathered together several bags of clothing she no longer wore, that needed to be carted to Goodwill. So, while she and I were sorting through her things, in order to make a list to make the donation tax deductible, I thought I would go upstairs and thin the Garment Herd populating my own closet, thus killing two birds with one trip to the Goodwill. Pardon the tangled metaphors. I’ll come back to this story in just a minute to explain how it connects to what I’ve been thinking about parenting. Here’s the second incident I wanted to recount, that seems related. I had a dream the other night. In my dream, I was back in my parents’ house, a place I haven’t been in 15 years. In my dream, my parents were still alive. It was Christmas time, the time that all six members of my family of origin used to gather together. We’d listen to old LPs on the stereo, eat the wonderful foods that filled the holidays of my childhood, and reconnect. My mom died when I was 29, and while she did get to meet my husband, and see us get married, she did not live to see either of my children. But, in my dream, there I was at my parents’ house, and Mom and my sister had come in from shopping, and they had my darling daughter with them, who in my dream was just a toddler. She had a pink toboggan over her head to shield her from the cold, and it had fallen over her eyes. I could see that her nose was running, that her face needed to be gently wiped off with a warm wet washcloth. and then I would pat those rosy cheeks dry, and kiss that sweet, clean baby face. My sister lifted the hat from my little daughter’s head, uncovering those green eyes of hers, and she saw me. And those huge eyes surrounded by starry black lashes lit up, and she reached for me with joy, crying, “Mama”. And then, I woke up. Upon awakening I remembered again the feeling of being loved that way by my children -so joyfully, and without reservation. I haven’t felt those emotions for years. Such a sweet, sweet feeling it is to be loved like that. It was a lovely, bittersweet dream. The dream evoked a feeling-memory deep inside me, the memory of the love that mothers feel when their children are at that stage when no one but Mama will do. The memory was so sweet, and the feeling was so deep and so strong that when I woke up, I started crying from the joy of re-feeling those strong emotions. As bonded as you might be to any of your kids, that’s how bonded I was to each of my kids. I was the one they reached out to, I was the one for whom they cried when they got hurt, it was my face that made their eyes light up, every morning, as they did their little happy-dance in the crib, when I came in to get them up. For me, those times were so sweet. Each day began with such joy! And they still love me, but oh, how some of the shine has worn off of the Mommy Apple, in their eyes. Part of my daily joy as a mom has dimmed, as they have gone through what I believe to be the normal and healthy developmental stages of growing up. They’re exploring new interests. They’re pursuing their own dreams. They’re trying on new versions of themselves – of who they might want to be. My opinions have become less sought after, sometimes even treated as irrelevant. Their friends, their peers have taken my former place. I know that this is, in general, the way things go for most teens. But still, occasionally, I mourn the loss of the intimacy we enjoyed for so many years. I know they still love me, and every once in a while I see flashes of that old love, but I am coming to accept this new place I have in their lives. I’m no longer the sun around which everything revolves. In fact, there are moments when my star seems to have completely fallen out of their heavens. My true position in their lives at present, reminds me more of an old sweater at the bottom of that pile of aforementioned clothes from my closet that we were getting ready to discard and drop off at the local Goodwill store. It – or I – served them well, for a time, but now they’re ready for something new. So in this process of ridding our closets of a bit of clutter, I see a connection to some things that are going on emotionally, for me, as the mom of a couple of chicks readying themselves to leave my nest. I bring my old blouses and sweaters downstairs to add to the donation bag. and metaphorically, it’s probably time to let go of a few old parental expectations, too: like the one where I hold a more central position in their lives. I know I am no longer that person to them. It’s past time to let that one go. Even so, it’s been a pretty painful process for a mom who has loved well. My words here are a part of my grieving process. “Could I keep it?” she asks with a smile, eyeing me somewhat coyly, knowing I was committed to getting rid of the junk, however painful. What I had let go of, ready to relegate it to the discard pile, opening wide my hands to let it go forever, my daughter has chosen to redeem, and to restyle, into something that fits who she is, now. A day or so later, I asked my daughter to help me cook dinner. So while we made enchiladas, I asked her to tell me about a particular friend of hers that I knew she was enjoying getting to know, and lo and behold, she opened up, and began to talk animatedly of that friend, and of her life. And then later on, in the evening, she mentioned to me a book she had read. It was a book about spirituality, a book I’ve spent a year reading, dissecting, teaching to other women, and trying to apply, myself. And without me ever recommending it to her, she had chosen to pick it up on her own, and read it, in three days. And then casually mention to me how much she’d enjoyed it. So, let’s see if I can pull all of these random ramblings together for you. When I look at my dream of my daughter as a baby, and the experience of donating clothing, and then later cooking with my daughter as we made dinner: I see a theme. I think my dream was reminding me of the preciousness of the love I have for my daughter. The love I have now is just as precious to me as the love I had for her the day she was born. But it’s grown over time, just as she has. And I think that the experience of cooking and enjoying talking about life that night is reminding me that in the midst of growing up and individuating – which is really her mission in life, at present, that she still loves me. So, we are in the process, she and I, of learning to connect on newer, more mutually respectful levels. And finally, I think sorting through the clothes that were donated to Goodwill was an incredible metaphor. 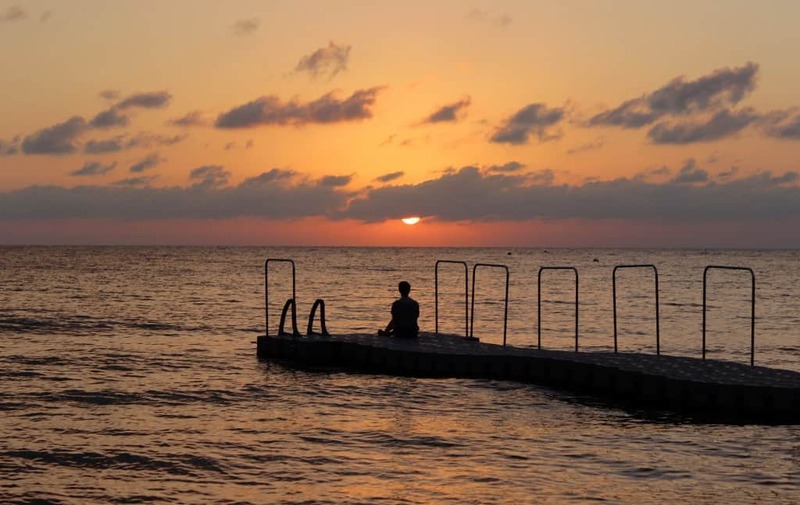 I’ve realized that I’ve got to let go of some things that are no longer working in our relationship – attitudes that were cluttering up our ability to connect to each other, as we are, now. But at the same time, I see us each choosing to hold on to some really good things that were there all along: dusting them off, shaking out a few wrinkles, and using them as the basis for some new outfits that will serve us better, in the now – in the “what actually is” of our lives. See? Everything really IS connected. Take the time to ask, and listen, and see what things the Father might have to show you. If you enjoyed this post, I’d be delighted for you to share it. When it comes to parenting teens, you might find that everything’s connected.